As a marketer, you may create pages for special promotions or events. You can expire a page and redirect visitors to a new URL after the promotion is over or the event date has passed. At the top of the editor, click the Settings tab. Select the Expire page on a specific date checkbox. Click the Expire on and at dropdown menus to select the page's expiration date and time. 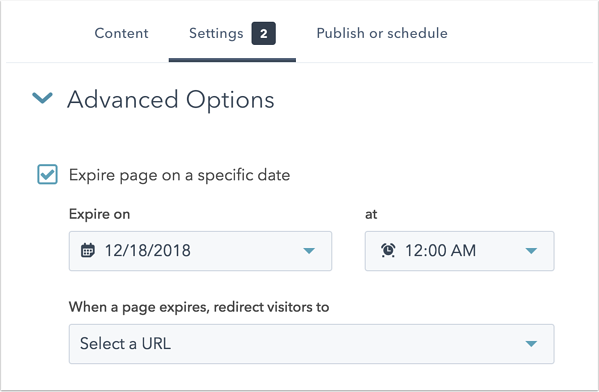 Click the When a page expires, redirect visitors to dropdown menu to select where this page should redirect after it expires. Choose one of your published HubSpot pages, or click + Enter an external URL and enter the URL to an external page. After the expiration date and time, the page will change from Published to Draft status in your landing pages or website pages dashboard.